Hat, no pattern, knit in Malabrigo — colors: Molly and Tiger Lily (dregs) on US6 needles. Started/finished 11/28. …I just might have 52 FOs by the end of the year. 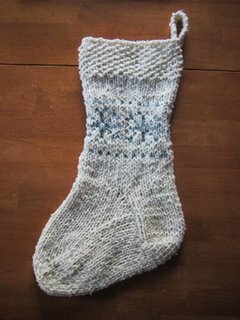 Let’s see…I just completed #46, and I have 47-51 on the needles, all Christmas gifts…so it could happen. The green ones are #45… the hollyberry ones were #35. The one in front is my bitty clog, which is freaking adorable and will be prominently displayed on my Christmas tree. When I put it up. Knit in Knitpicks Wool of the Andes, Natural and Grass. 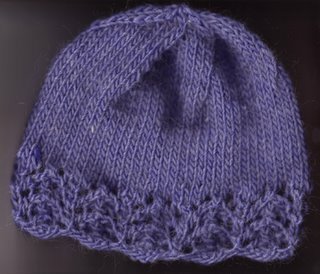 This lace-edged hat is the companion to the baby one that I made in the spring. Someone on KH was looking for an adult lace-edged hat so I offered to resize the pattern. 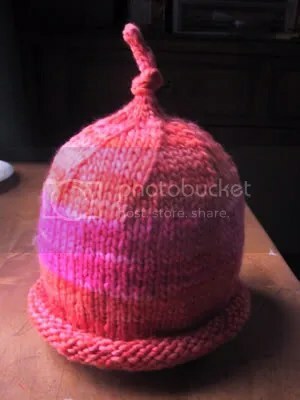 Turned out great if you’re into the snug-hat thing….looks awful on *me*, though! Now for the testing — it’ll be interesting to see how others do with my instructions. If all goes well, perhaps I’ll submit it to headhuggers.org. 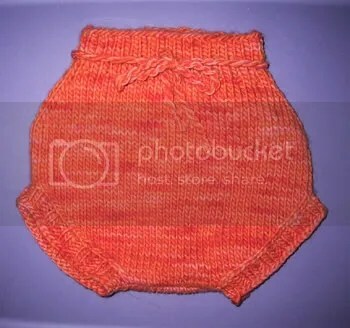 The pattern for 5 sts/inch (not the 4 sts/inchshown) would make a really nice chemo cap, I think. Knit in Brown Sheep Prairie Silks (color: peseta purple) on US8 needles. Knit in the most wonderful wool on earth, Malabrigo worsted — colors: Molly and Tiger Lily. 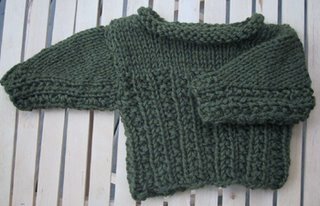 (1 skein for each soaker) on US6 needles. …knitting and finishing things. I’m just not posting them because they’re gifts (Christmas and otherwise). All will be cleared from my drafts folder after the holidays. I have a ridiculous number of projects both on the needles and waiting to go on the needles. Cozy, three scarves, more clogs, mittens, and various small gifty things. 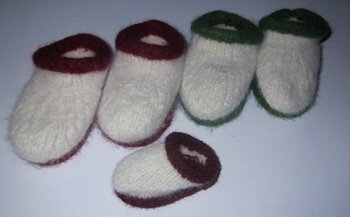 What I really want to knit though, dare I say it, is more socks. 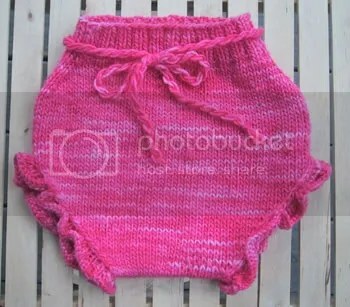 I can’t believe I actually knit them in the first place, let alone that I’m considering doing it again. Go figure. Knit in Knitpicks Andean Silk (color: olive), doubled, on US13 needles. Knit in Marr Haven wool on US10 needles. 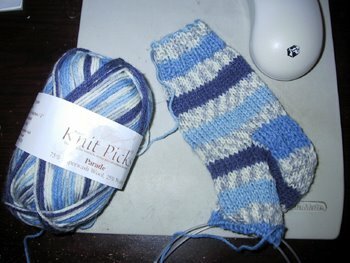 Knit in Knitpicks Parade, color: Blues (1 skein) on US4 needles. I’ve gone back and forth on the sock thing quite a few times. I don’t wave the tiny-yarn flag, nor the tiny-needles flag, so when I finally decided to give it a go, I chose Parade, which knits on size 3-5 needles. Still pretty freaking small if you ask me. 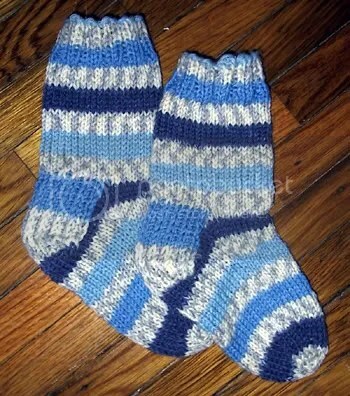 I started off planning to use the Children in Common pattern, because it has a short row heel instead of the whole flap/gusset, which to me looked do-able but not fun, and I’m kinda lazy, so short rows seemed more attractive. I got through the heel but didn’t have the energy to figure out how to pick up the short row wraps from the right side, so it was looking pretty squirrely. Sooo…I frogged back to before the heel, and continued using Silver’s awesome Sock Class. And what do you know…..it’s looking pretty sock-like…..